Exercising in the water is considered one of the most heart-healthy and joint-friendly ways to exercise. Have you ever noticed while you are in the water that you are able to do things in the water that you cannot do on land? When you are in water, the buoyancy of the water makes you feel like you are floating, right? Feeling lighter in the water means there is less weight being distributed through your joints such as the ankles, knees and spine. Your shoulders also get a well-deserved break since the buoyancy of the water allows your arms to float to the surface of the water. So, you might ask, how aquatic therapy works. Physical therapists use the water to, as I stated before, allow patients to do things in the water they may not be able to do on land. For example, if they have pain in their knees when walking on dry land, aquatic therapy would allow the patient to walk without any pain in their knees while in the water, thereby allowing them to strengthen the muscles more effectively. In fact, when you are standing in waist-deep water, you are putting 50% less weight through your lower extremity joints; increase the depth of the water to chest-deep, and the benefit is 80% less strain on your lower extremity joints! What a great opportunity to take stress off your joints! Did you ever just float in the water and feel better, more rested? It is not a big surprise that one of the underlying meanings of the word buoyancy is lightness of spirit/cheerfulness. Now I know you are wondering how the water is going to get your stronger. I agree, you cannot just float around all the time. Let me introduce you to viscosity, otherwise known as drag, which is the reason why you cannot walk or run as fast in the water as you can on land. In the water, you are surrounded by resistance. Every movement you take forward or back, is more effort than it is on land. It has been found that exercises in the water provide up to twelve times more resistance than exercises performed in “air” or on land. Now all you have to do is put the two together for everything to make sense. When you do your exercises, you are working harder doing them in the water; however it does not feel harder, due to the buoyancy of the water. Have you ever participated in a water exercise class in which you felt great during class, however once you finished, your muscles felt so much more tired on dry land? You can thank buoyancy and viscosity for that! 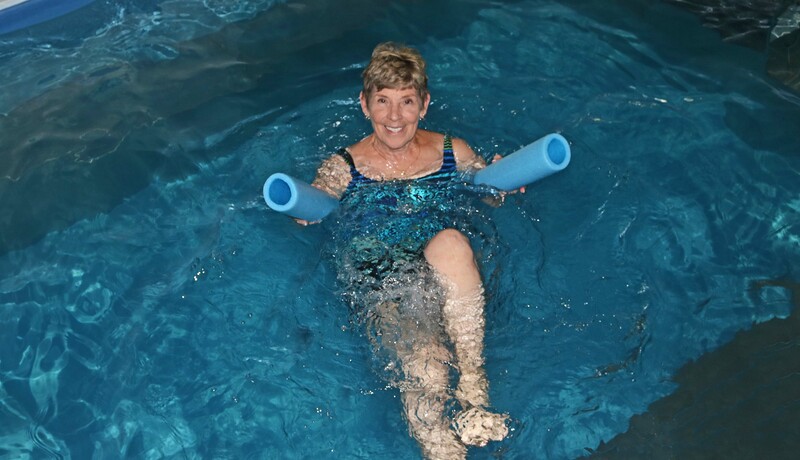 HARTZ Physical Therapy offers aquatic therapy in our Lititz office. It is a great option to recover from any injury.